The first half of July's #WineStudio chat focused on Aurelio Montes Sr. and his popular Chilean winery Viña Montes. The second half of the month continued with the same family but segued to his son Aurelio Jr. and the family's venture into Argentina through Kaiken Wines. Their "aim was to make great wines by combining the exceptional conditions of the Mendoza region with the talents of professionals from Argentina and Chile". The Kaiken name refers to this crossing of the Andes as does the Caiquen birds every migratory season. The winery was established in 2001, growing from two wines to five separate brands today. Our tasting focused on two of these brands, the Terroir Series and the Kaiken Ultra. 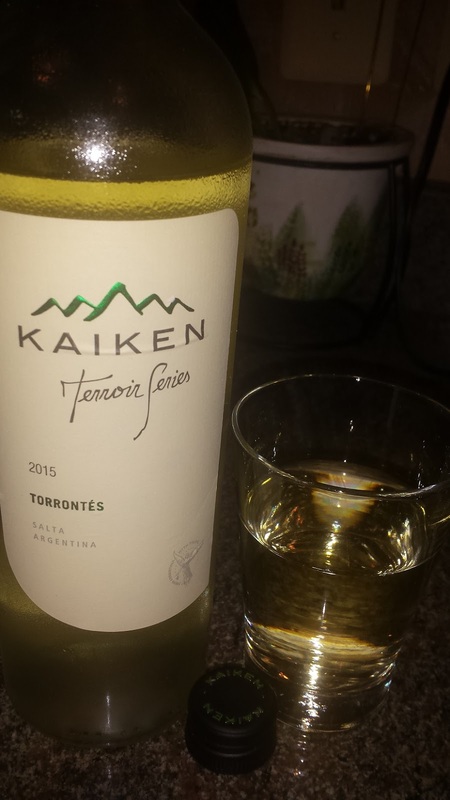 With the 2015 Kaiken Terroir Series Torrontés ($17, 13.5%), the winery focuses on the Salta wine region - one of the highest in the world. We are talking about 4,500 feet above sea level. Aurelio Jr. mentioned that working at such extreme altitudes presents challenges every year, but the specific location, the Cafayate Valley, has 320 sunny days per year and a large nightly diurnal temperature swing. The vines for Torrontés are over 80 years old but this wine is fresh with a powerful aroma of flowers, apricots and nuts. It then transitions to a velvety creamy mid-palate, finishing with plenty of acids and a hint of saline. Many of us likened it to a Virginia Viognier, although this Torrontés has way more acidity. A fabulous wine. 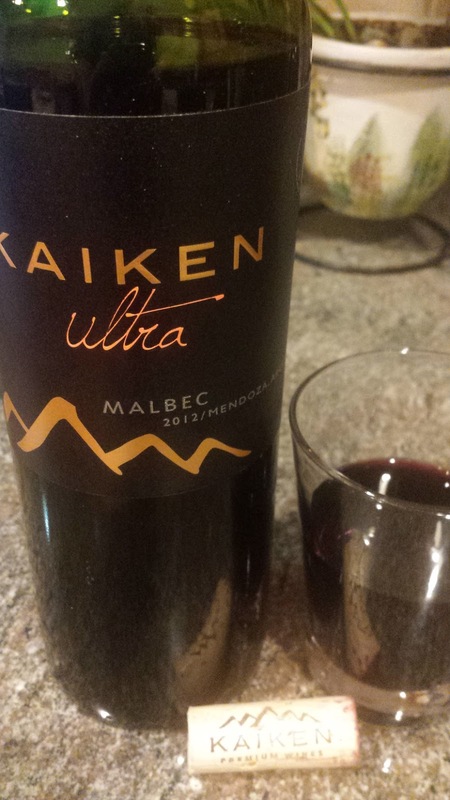 We returned to Kaiken's Mendoza roots with the 2012 Kaiken Ultra Malbec ($24, 14.5%). The region is not as elevated as Salta, but still pretty hefty at 2,000 to 3,500 feet above sea level. The region accounts for almost 2/3 of Argentina's wine production and was that county's first appellation. Like the Torrontés, this Malbec has plenty of fresh acids that mingle with the red cherry, tobacco, and spicy flavors. There's also plenty of tannins, I got scolded for mentioning that the wine crippled the tongue - but the lively acids alleviate most of the puckering. This one should go down into the cellar - but it's definitely drinkable now. In 1219, St. Francis of Assisi and several disciples traveled to Palestine in order to preach to the Christian forces and to evangelize the infidels. His group traveled throughout the region, from Syrah to Egypt -- where his famous audience with the Sultan occurred. Some believe that he returned to his native Umbria with a previously unknown grape variety to produce sacramental wine. The grape was Sagrantino, derived from the Latin “Sacer” or Sacred, and in fact, was cultivated by monks to produce a raisin wine for religious rites. Perhaps, the grape variety didn't originate in Italy from St. Francis himself, but by Franciscan monks returning from Turkey, another theory. Regardless, Sagrantino is now considered an indigenous Italian grape and is found only around the hilltop town of Montefalco. Whereas Umbria is central to Italy, Montefalco is centrally located within Umbria. Wine production is an inherit part of the region's culture and wine making even occurred within the medieval city walls. As early as the16th century authorities had established wine making rules protecting vineyards and wine making, with one of these laws establishing the earliest possible harvest date. However, over time, Sagrantino and wine making in general dwindled to where the grape almost completely disappeared. 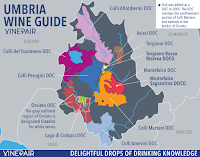 A few wine producers persisted and a renaissance erupted in the 1970s leading to a Denominazione di Origine Controllata (DOC) label in 1979, followed by a more esteemed Denominazione d'Origine Controllata e Garantita (DOCG) label in 1992. Interestingly, Sagrantino vines were still growing within the Montefalco city walls and after scientific analysis, several vines are considered to be 200-300 years old. 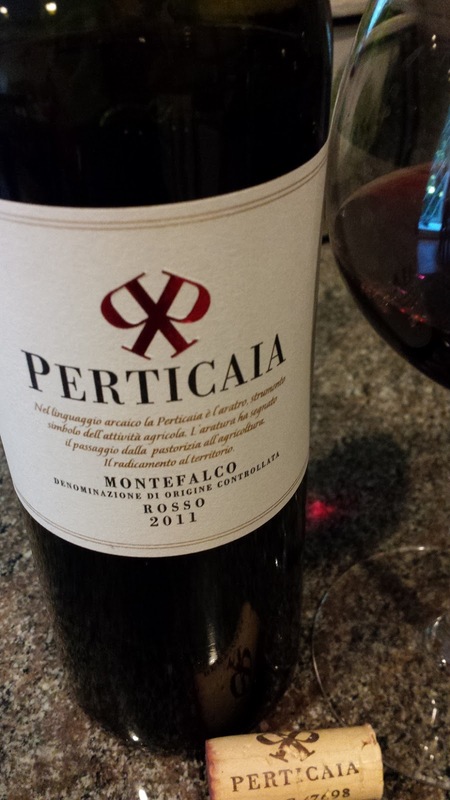 On July 7th, 2015 the Montefalco Consortium issues a press release announcing a change to the Montefalco Rosso DOC regulations. Previous composition: 60-70% Sangiovese, 10-15% Sagrantino, 15-30% other authorized varietals. New composition: 60-80% Sangiovese and 10-25% Sagrantino. Aging: minimum 30 months, with at least 12 months in oak. Two of these producers reinvigorating wine making in Montefalco were Guido Guardigli and the Antonelli family. In the early 1990s, during a trip to the region, Guardigli was inspired by the potential of both the territory and signature grape. After purchasing the property, he planted what would eventually become 15 hectares of vines as well as built a new state of the art winery. He named his venture, Perticaia - old Umbrian for plow. Those 15 hectares of vineyards are almost half planted with Sagrantino, a quarter with Sangiovese, and the remainder in Colorino, Trebbiano Spoletino, and Grechetto. The Antonelli family have been farming in Spoleto, just north of the village of Montefalco, since1881 when Francesco Antonelli purchased the San Marco de Corticellis estate (once owned by the Bishopric of Spoleto). In 1979 the family starting bottling and selling its wine and in 1986 5th generation Filippo Antonelli took the helm. From 1996 to 2006 he was president of the “Consorzio Tutela Vini Montefalco” and also manages a second family wine estate, Castello di Torre in Pietra. Currently the Antonelli estate contains 40 hectares of planted vines, predominately Sagrantino (some 30 years old) and Sangiovese, with smaller plantings of Montepulciano, Merlot and Cabernet Sauvignon. White wine grapes are represented by Grechetto and Trebbiano Spoletin. This August, the Montefalco Wine Consortium is participating in the 2015 Wine Bloggers Conference with a program titled “Discover Sagrantino, Umbria’s Signature Wine”. In order to promote the region, the group organized a twitter campaign and selected several bloggers at random to receive samples. I was one of these fortunate souls and received the two wines below. My first impression is that Sagrantino is inherently tannic; in fact, I later learned, it is one of the most tannic varieties in the world. Thus, decanting is mandatory. Yet, these tannins are chewy and blend seamlessly with the wine's mineral character and acids. And like a majority of Old World wines, Sagrantino is meant to be consumed with food, try these ragu and gnocchi recipes. 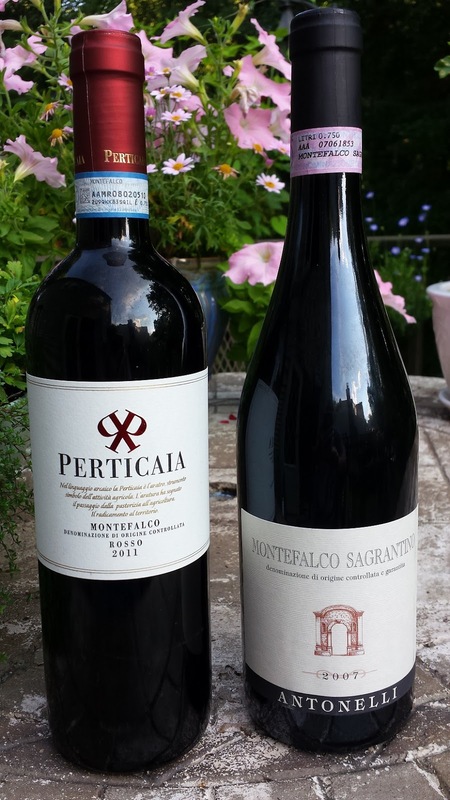 Perticaia Montefalco Rosso DOC 2011 (12% ABV) - Sangiovese 70%; Sagrantino 15%; Colorino 15%. Aged 18 months with 12 months in stainless steel and 6 months in the bottle. Starts with a cranberry aroma, which leads to a dry medium bodied wines with noticeable chewy leather tannins. 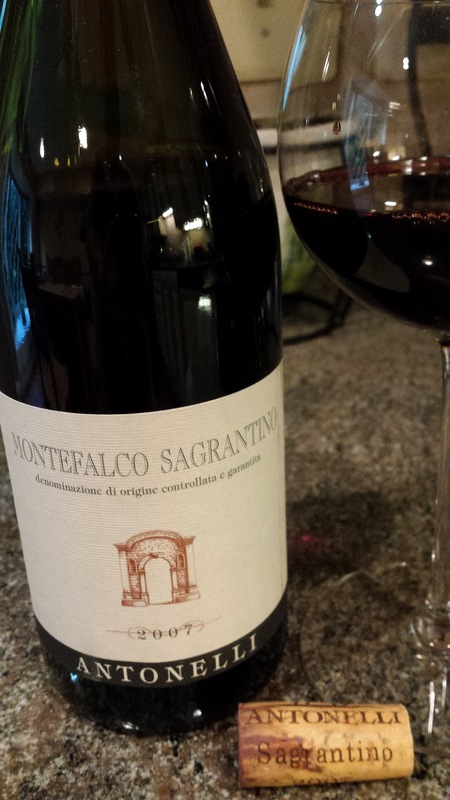 Antonelli Sagrantino di Montefalco DOCG 2007 (14% ABV) - Sagrantino 100%. Full bodied; dark fruit on the nose; jammy blackberries, minerals and depth, acids and very persistent chewy tannins. Persistent even after almost five additional years in the bottle. Begs for game or sausages. This past week we enjoyed more Minor League baseball with moon bounces, Monkey Rodeo, and Pennsylvania beer at the Harrisburg Senators Metro Bank Park. Although it's $2 Coors night on Thursdays, I found myself gravitating to the Appalachian Brewing Company beers located in the right field food court. Look for the Hershey signs. The Mountain Lager is a solid, refreshing beer. 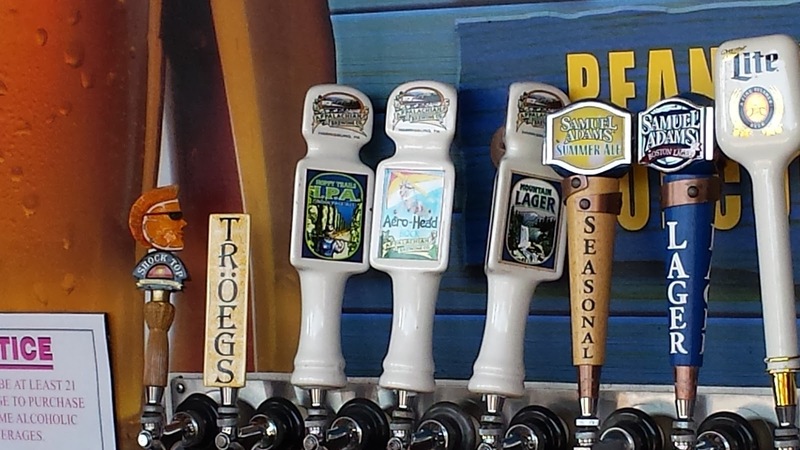 Troegs Brewing is also available at this stand as well as a couple others on the upper left field beer stands. 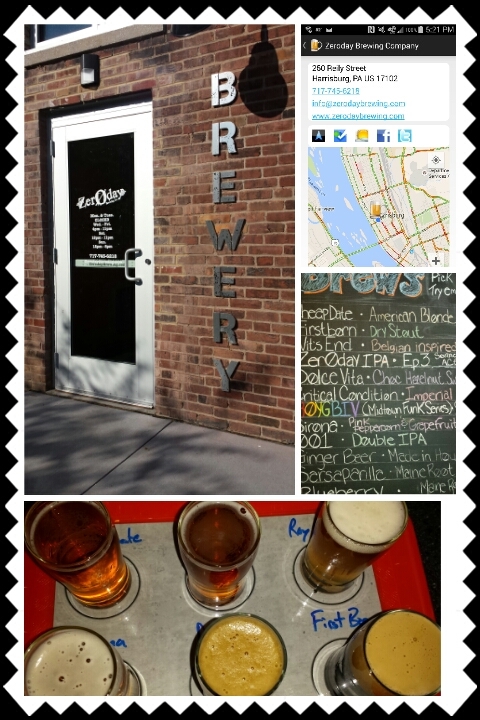 Now, if you'll looking for a good spot to tailgate before or after the game, I recommend Zeroday Brewing Company, located only a couple miles across the Susquehanna River in Harrisburg's Midtown district. theCompass Winery, Brewery, Distillery Locator Mobile Application can provide directions. 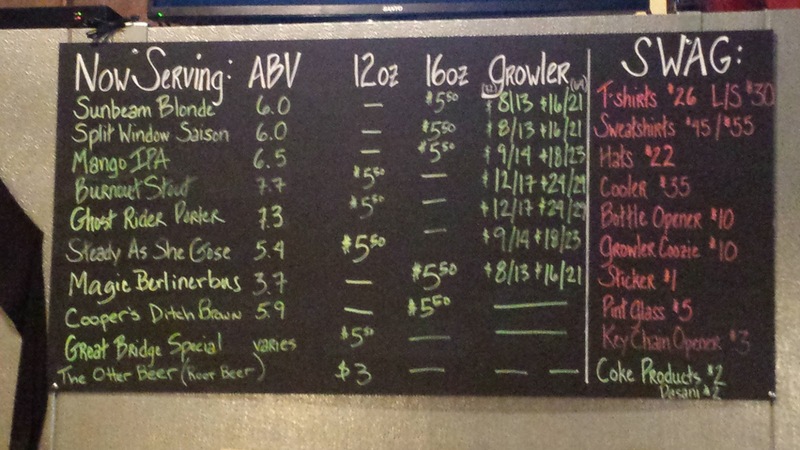 The brewery opened this year, just in time for the 2015 season and brews a wide selection of beer from blondes to dark stouts.By far my favorite beer was the ROYGBIV Midtown Funk - a limited release Saison with plenty of funky depth which tastes more like a wine than beer. The Cheap Date is a solid blonde whereas the Dolce Vita (Chocolate & Hazelnut Sweet Stout) is nutella in a glass. For those who prefer wine or cider, the brewery offers local options from Knob Hall Winery and The Vineyard at Hershey's Weiser Orchards Honeycrisp Cider. Cheers to #pabeer and minor league baseball. 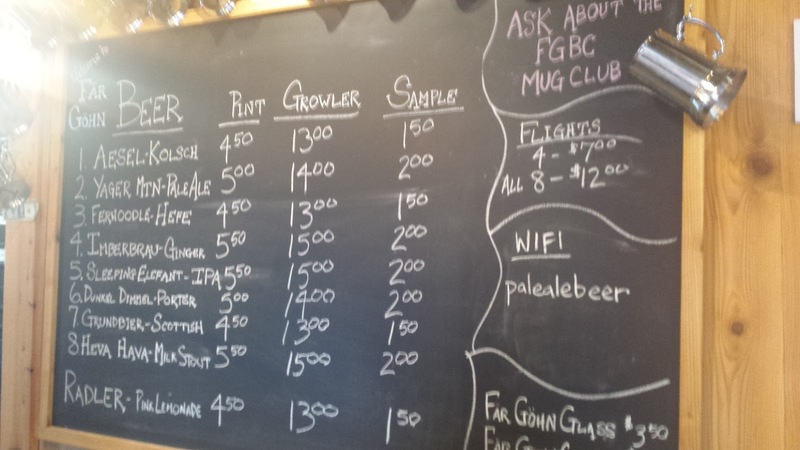 Update: the post was updated to include Zeroday Brewing. While returning from the Outre Banks, we decided to spend the night in Norfolk, with the Virginia Zoo in one mind; the #VABreweryChallenge in the other. The Zoo is rather impression, primarily from it's botanical gardens, as our the two breweries we visited afterwards. Both are in located in the same proximity in the Ghent and Chelsea neighborhoods which made travel between the two very easy with theCompass Winery Brewery Distillery Locator. O'Connor Brewing Co. is the larger and older of the two; with owner/brewer Kevin O'Connor learning the brewing and wholesale side of the trade at St. George Brewing Company and Specialty Beverage. I've been a long time fan of their El Guapo Agave India Pale Ale as I've been able to aquire a bottle here and there. Just enough agave to make it interesting. For a summer ale, the Green Can is a solid light bodied ale; as is the Norfolk Canyon Pale Ale - the medium hops provide a mellow finish. For a stronger beer and a bit of history try the Great Dismal Black IPA - I remember riding on the outskirts along Route 17 long ago. 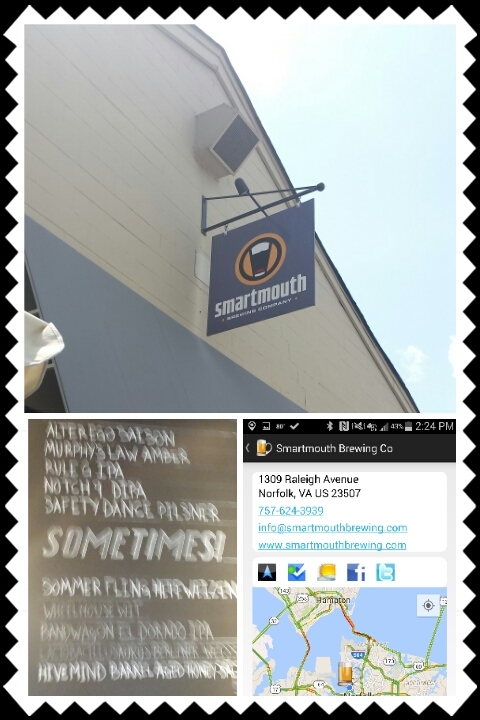 Smartmouth Brewing Co opened two years after O'Connor in 2012 in the Chelsea neighborhood. The brewery hits a range of styles from German to Belgium to American and the first I saw was a low 2.5 % abv Berliner Weisse. Tart and refreshing. On the other side of the spectrum was the Hive Mind Barrel-Aged Honey Saison. Aged in used Chardonnay barrels, the beer has a creamy texture, with a slight sweet spot balanced by some spice. Quite nice. For the less adventurist, the Safety Dance Pilsner is slightly hoppy and refreshing and the hops head will like the Bandwagon 4.0 IPA single hopped with El Dorado. They joined the bandwagon. Well played Smartmouth. Cheers. With a rich brewing history as the home of Pabst, Schlitz, Miller, and Blatz, Milwaukee is often sited as the Beer Capital of the World. Whereas some of these giants still remain in different forms, it's the city's craft beer movement that helps maintain that exalted title. During a recent trip to the Brew City, I visited several craft breweries and saw how the Pedal Tavern was making trips to various establishments easy for consumers. No need for theCompass while pedaling these moving bars. Our first stop was to the Milwaukee Ale House, the satellite brewpub of the city's oldest micro brewery, Milwaukee Brewing Company. Located adjacent to the Milwaukee River and the Riverwalk, this pub brews several of the house beers onsite and offers numerous guest beers - this week Surly Brewing Company was in the house. 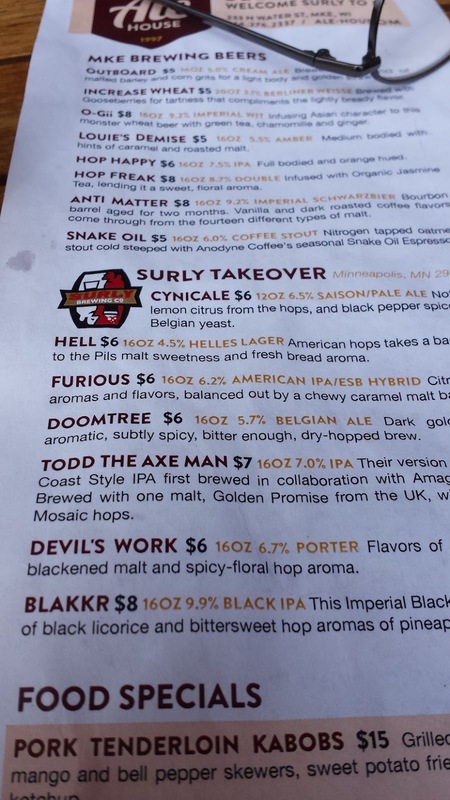 Obviously I had to go with that brand's Todd The Axe Man IPA, but also sampled several of the MBC beers that were quite nice like the Increase Wheat, Anti Matter (Imperial Schwarzbier), Snake Oil (Coffee Stout), and . No need to worry about ABV on this trip - no driving. Throughout the weekend, my go to beer at restaurants was the readily available Outboard (Cream Ale). The second stop during the trip was to Brenner Brewing Company, where I had first sampled their Bacon Bomb Rauchbier at SAVOR a week earlier. I love this beer, smoky, but not overly so with a light body. On the other extreme, their Summer Blonde was nice as was the Butterfly Farts Saison. My favorite was their Oak Aged Anxious, a Porter aged in oak. Smooth, some heat, complex flavors. This was also our introduction to the pedal tavern, as several groups migrated in and out of Brenner during out visit. Wonder if they pedal back to our hotel? 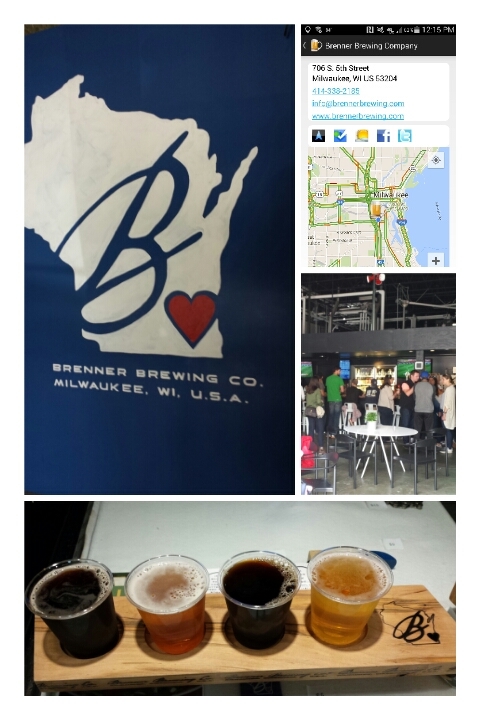 The Milwaukee Brewing Company's main facility is located only a few blocks from Brenner, but unfortunately that hour's tasting was sold out. Tours are conducted on the hour and is quite the experience. For $10, you get a tour and unlimited beer for that hour; no wonder tickets fly fast. 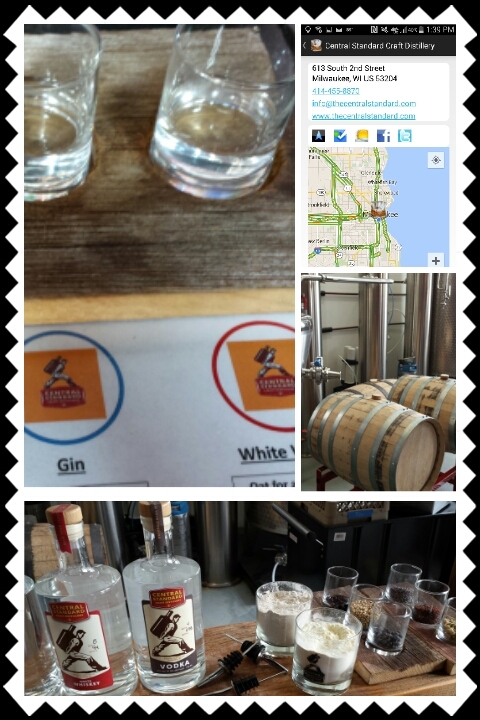 Fortunately however, the Central Standard Craft Distillery is located within the brewery and not only pours several MCB beers, but offers samples of their three spirits. I started with the Vodka, 100% Rye which gives a slight, slight spice character to this otherwise smooth spirit. Smooth, as in zero burn. I enjoyed their Gin, more than most because they go easy on the juniper and instead there's more of a floral, even slight tropical profile. Finally, there's the White Whiskey, with a predominately oat mash bill and aged in uncharred and unused oak. This one, does have some bite, but also sweet, complex flavors. Also, look out for their Bourbons currently aging; expect a young 6 months version as well as a maturer 2 year version. 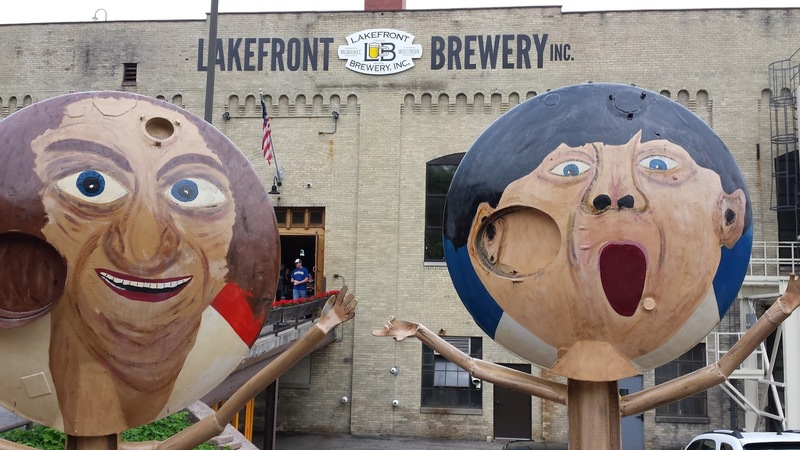 The final noteworthy stop was to Lakefront Brewery, a highly recommended establishment also on the Milwaukee River. Their outside area is a peaceful setting to enjoy their beers, particularly when the German style bier hall is crowded. Their IPA was everyone's favorite, with the Extended Play Session IPA not far behind. The Riverwest Stein (American Amber\Red Lager) was smooth with a strong sweet, malty profile. A nice selection of beers. On the not so nice beers on the trip were a couple from Leinenkugel's 10th Street Brewery. The stadium was selling some form of overly malted beer trying to pass as an IPA, and the Shandy, well, I'll leave that one alone. There was also a Rock Bottom Brewery near our hotel and their beer was in the minor leagues as compared the others. But these were the exceptions, not the rule. 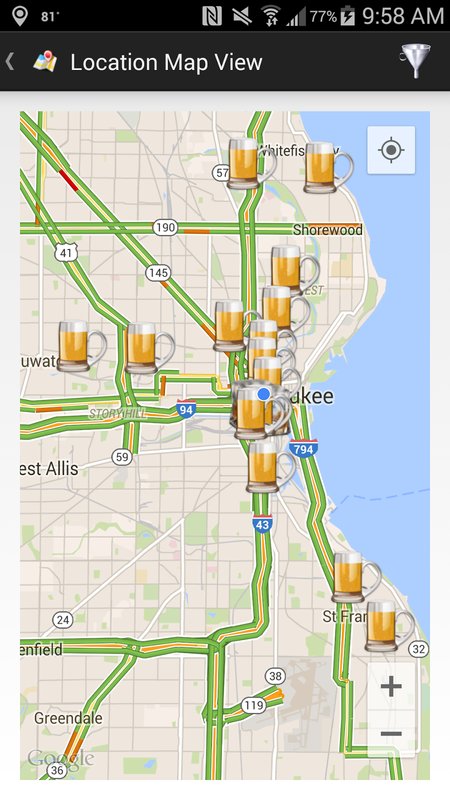 Milwaukee is still running as the "Beer Capital of the World". Cheers. July's weekly #WineStudio chat focuses on the popular Chilean winery Viña Montes; specifically their sustainability program and their venture into Argentina with the Kaiken brand. Montes has been operating since 1988 (founded by Aurelio Montes, Douglas Murray, Alfredo Vidaurre, and Pedro Grand) and soon became the "benchmark for premium Chilean wines". Eventually the owners determined that a more sustainable farming approach was needed and designed a vineyard management program to satisfy this desire. The program consists of five primary goals or areas: Integrated Management, Maintaining Plant Cover, Less Water Use, Composting, and Use of Grazing Animals. The most discussed area was the winery's ability to decrease water consumption by dry farming - basically letting mother nature water the vines through rain instead of costly and energy intensive irrigation systems. Obviously, dry farming is most advantageous on soils with high water retention. Montes states that "we have decreased water consumption by 25% in Marchigüe and 10% in Apalta—a savings equivalent to the amount of water used by 3,200 families each year". An added bonus is that the lower yields more clearly express the terrior of the area as the vines dig ever deeper to find more sources of water. For the first part of this session we received two wines from Montes that represented the North-South axis of Chile. The Carmenère was grown on the above mentioned "Dry Farming" philosophy and includes a designation on the label. 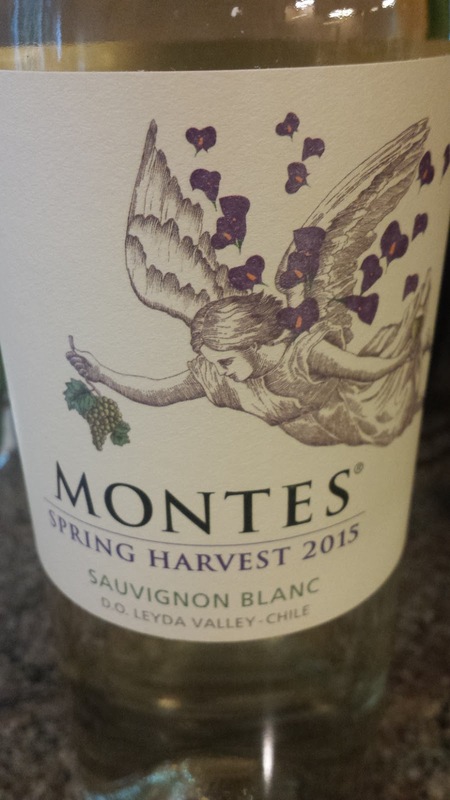 Montes Spring Harvest Sauvignon Blanc 2015 ($14, 12.5%) - grapes harvested from the northern Leyda Valley, located just 8 kilometers from the Pacific, and area with abundant winter rainfall, with the vines planted in granite and clay soils. Because of judicious canopy management, the grapes were harvested in early spring, which in Chile translates to late February. The result is a fantastic wine, particularly for us acid lovers. There is abundant stone and tropical fruits, some mint and lemongrass, and plenty of acids. 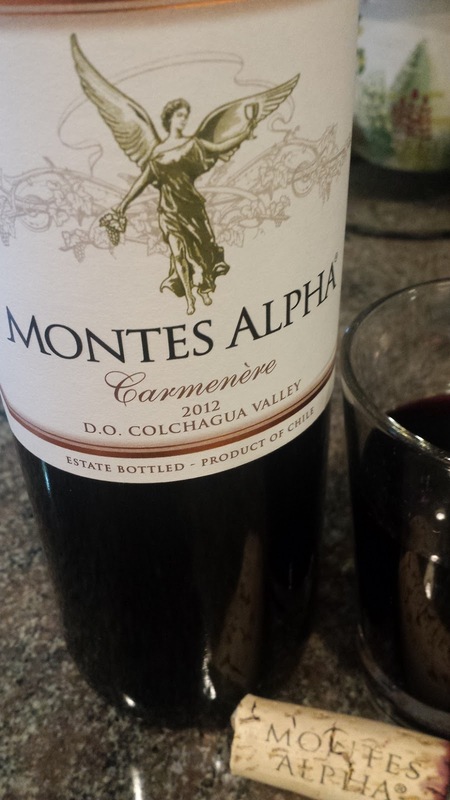 Montes Alpha Carmenère 2012 ($20, 14.5%) - 90% of Carmenère & 10% Cabernet Sauvignon - grapes harvested from the El Arcángel Marchigüe estate, located at the western end of Colchagua Valley, in a more southern locale. The site is further east as well, 18 kilometers from the coast, with clay soils, and a cooler climate enabling later ripening. After fermenting, the wine was aged 12 months in French oak. My first suggestion is to decant. Then enjoy the cherry pepper aroma; dense, dusty, smoky blackberries and dark chocolate; and definite tannic finish. An excellent example of Carmenère. 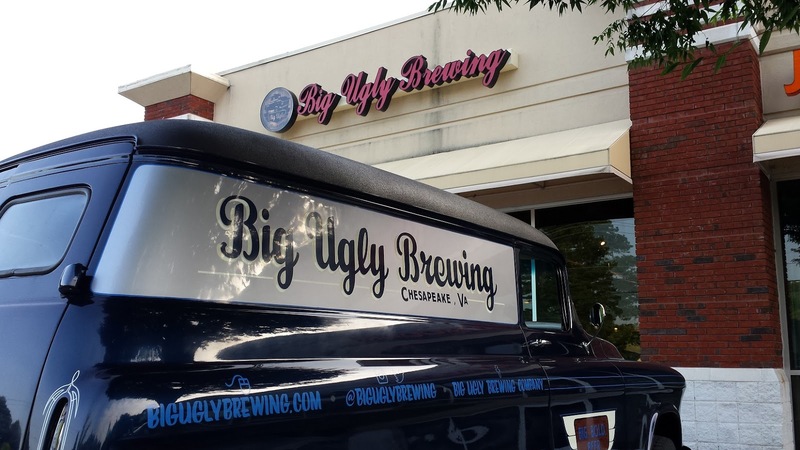 So far the coolest spot we've visited for the #VABreweryChallenge has to be Big Ugly Brewing Company. The brewery is located off Battlefield Blvd, just south of Chesapeake, on the route to the Outer Banks; a perfect growler filling station. That was our purpose as we spent the night in Chesapeake on our way to Ocracoke and visited during Thirsty Thursday trivia night. Upon arriving its hard not to notice the unique benches out front or the retrofitted Big Ugly mobile and once inside the motorcycle seats, van seating area, and wall decor. Pretty much worth the trip in itself. But also, the beer is rather tasty; particularly when I can start off with the Steady As She Gose. 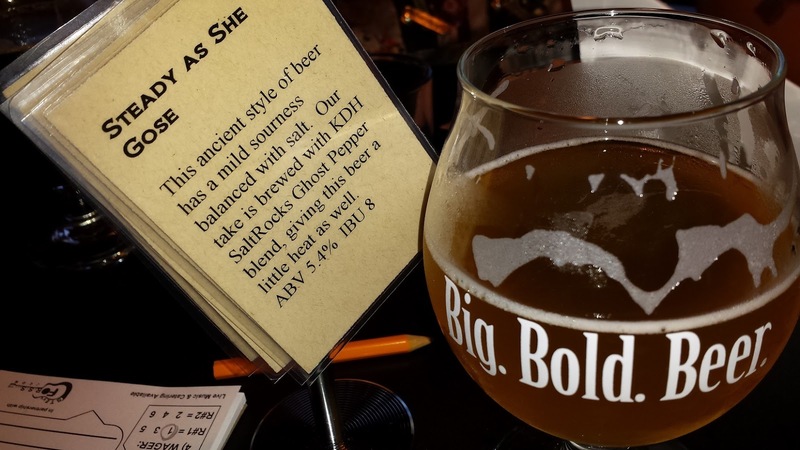 This gose is different, brewed with a dash of pepper in addition to the expected salt to provide a little heat and spice. The Sunbeam Blonde was a table favorite as was the Ghost Rider Porter. For a clean hoppy bear try the Mango IPA. I can guarantee another stop next year during the drive to the beach. And for history buffs, the Battle of Great Bridge park is only minutes away. Learn about the first land battle of the Revolutionary War in Virginia. Cheers. After countless trips to Charlottesville, I finally skirted off Route 29 and headed into downtown Culpeper. 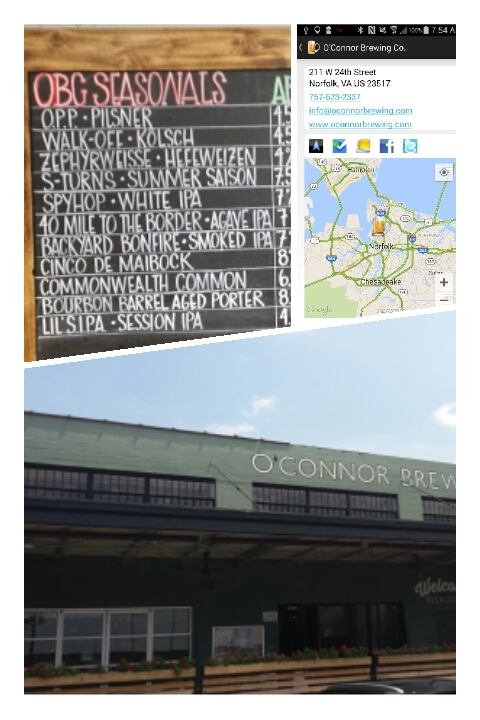 theCompass app had alerted me that the railroad town hosts two new breweries, so another stop on the #VABreweryChallenge. Far Gohn Brewing Company was our first destination and founder Steve Gohn poured our first round and discussed his beers. The brewery specializes and German styles, augmented with a few British and American styles. I started with the Aesel Kolsch, clean, a tad salty and refreshing; and followed with a flight of the Yager Mountain Pale Ale, Ferhoodle Hefe, Dunkel Dimmel Porter, and Heva Hava Milk Stout. The later was another favorite: chocolate cream. 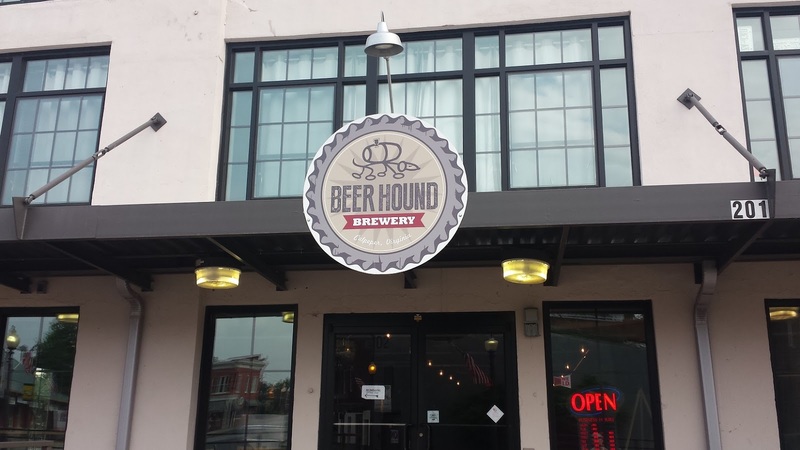 Beer Hound Brewery makes it's home just a few blocks away right off the railroad tracks. It is larger and older than Far Gohn, having evolved from from Kenny Thacker's original 2012 operation. 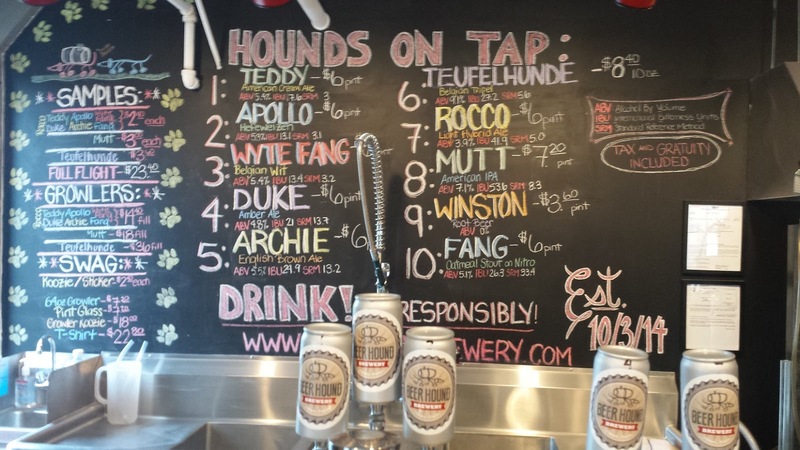 Their beers are named after famous hounds in movies and history like Teddy, the brewery dog. This beer nails the American Cram Ale as the Teufelhunde does with a Belgium Tripel. The Belgium Wit Wyte Fang was also spot on. Food is not served at either location, but feel free to being in your own. They are both worth a sit down meal. Cheers. Last month I received samples from Oak Ridge Winery, specifically four wines focusing on their unique Old Soul brand. I say unique in the sense that this brand focuses on non-Zinfandel grape varieties and as the oldest winery in Lodi, these grapes have an "old soul". Oak Ridge's Zin is rather tasty, so was excited to get started. Old Soul 2013 Lodi Chardonnay ($14, 13.5%) starts with tropical and stone fruits on the nose and palate, but then the buttery oak starts to dominate the wine. The butter almost overwhelms the favorable lemon pepper spice finish. Would love to try an unoaked version of this wine. Old Soul 2014 Lodi Pinot Noir ($14, 13.5%) - blended with Zinfandel and Merlot. Plenty of sweet red fruits on the nose; dark blackberry fruit on the palate; easy finish with subtle spice and tannins.Very approachable, although comes across on the sweeter side. Old Soul 2012 Lodi Cabernet Sauvignon ($14, 13.5%) - blended with Zinfandel and Merlot. Jammy throughout, dark cherries on the nose then blackberries on the palate. Slight spice on the tail. Like the Pinot, feels slightly sweet. Old Soul 2013 “Pure Red” Blend ($14, 13.5%) - a blend of Cabernet Sauvignon, Zinfandel, Petite Sirah. Cherry spice on nose, deep blackberry fruit, easy chewy tannins for a savory finish. One of my favorite wine country destinations in Virginia is Nelson County, located just southwest of Charlottesville and encompassing the Blue Ridge Parkway. Initially it was the county's mountains and wine that attracted me to the area, then a few breweries like Blue Mountain Brewery and Devils Backbone opened, then Bold Rock Cidery. 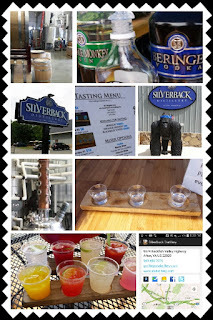 Now there's another excuse - Silverback Distillery, with a new spirits brand available throughout the Virginia ABC system. The distillery is owned and operated by Christine and Denver Riggleman and they produce three spirits: Beringei Vodka, Strange Monkey Gin, and Blackback White Grain Spirit. In order to provide tastings at the distillery, state regulations require that consumers be limited to 4 ounces of spirits over a 24 hour period. Rather crazy considering a person could then travel to nearby Blue Mountain or Cardinal Point Vineyard & Winery and drink unlimited quantities of beer or wine. In order to make this restriction bearable to visitors, Silverback created a few cocktail flights which serve a dual purpose. 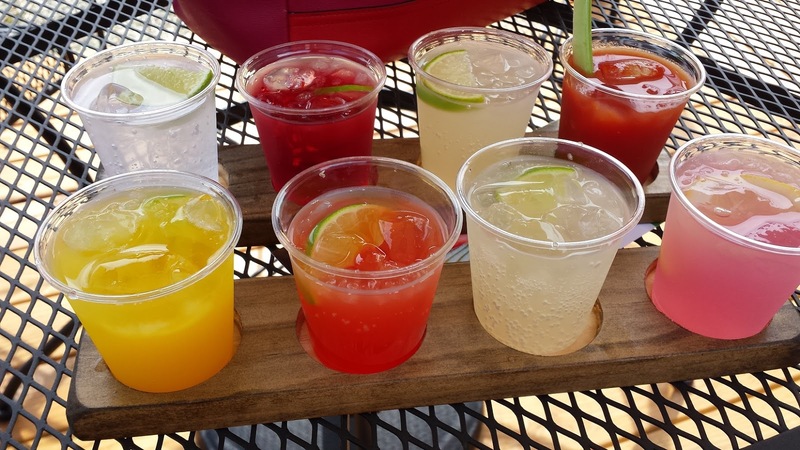 Not only do they provide customers enjoyable libations during their visit, but they also provide future recipes after purchasing a bottle or two. Samples also are provided neat which gave me a clear representation of their spirits. The Beringei Vodka ($30 750 ml, 80 proof) is made from predominately winter wheat and is very clean, slightly sweet, with absolutely zero burn. The Blackback White Grain Spirit ($17 750 ml, 90 proof) has a high percentage of corn in the mash bill augmented by winter wheat. Thus, on the one hand the corn provides sweetness and spice, on the other, the winter wheat mellows the profile. This moonshine styled spirit is sweet with a minor burn. Be prepared for an aged version of the white grain that is currently residing in American Oak barrels. 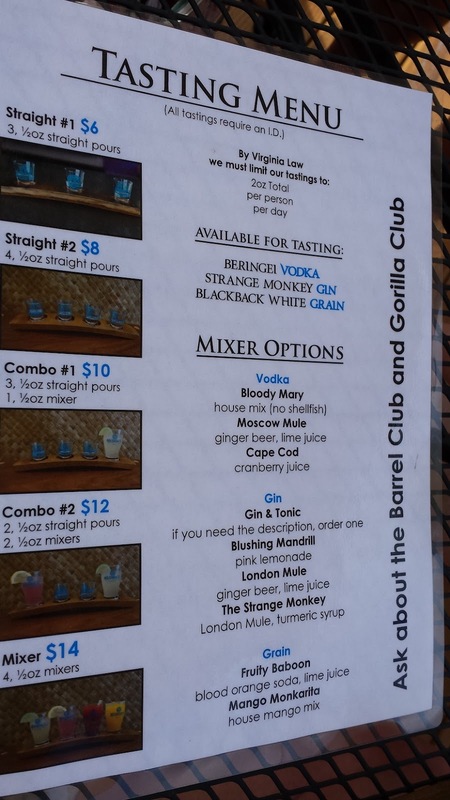 The biggest surprise was the Strange Monkey Gin ($30 750 ml, 80 proof). Not particular fond of gin, this version was rather tasty as the distillery held back on the juniper. This was worth the price of admission alone. As for the cocktails, the Moscow Mule (vodka) and London Mule (gin) were my favorites with the spirit mixed with ginger beer and lime juice. And both grain cocktails were nice, the Fruity Baboon (blood orange soda and lime juice) and Mango Monkarita (house mango mix). Cheers and safe travels while using theCompass Winery, Brewery, Distillery Locator Mobile App. Looking for good food and a good sour (after all I am moving to the sour side), Charlottesville's South Street Brewery was a fitting stop on our #VABreweryChallenge. And why not? The brewery is owned and operated by Mandi and Taylor Smack of Blue Mountain Brewery fame, who purchased their old employer (Taylor was the brewer from late 2001 until early 2007) last year. Located adjacent to the Downtown Mall, the brewpub provides a broad portfolio of beer options including the Slippery When Wit. This Gose\Witbier hybrid was both tart and spicy - combining the pleasant characteristics of both styles. Quite good. I also enjoyed the El Jefe wheat beer and for dessert the chocolatey and heavy Anastasia's Chocolate Fantasy. This is one powerful beer. Of the lagers, the Classic Lager was pale and refreshing whereas the Virginia Lager was more malt forward in an amber ale style. We preferred the Classic. The food was also enjoyable (Pot Roast Grilled Cheese), particularly paired with a Virginia wine, in which they have several on the menu. The Pollak Vineyards Viognier was a favorite with our group. Our group was sad to leave, but fortunately the next day I found the Slippery When Wit in the can. Happy days. 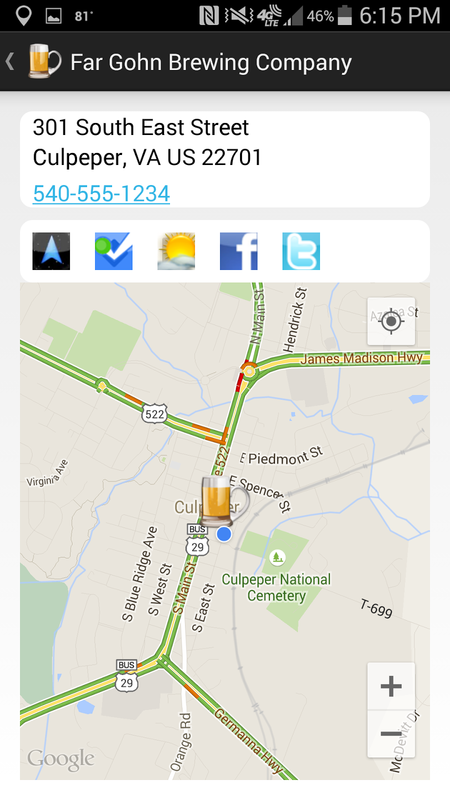 Cheers and safe travels while using theCompass Winery, Brewery, Distillery Locator Mobile App. Ironically, the Tyson's Gordon Biersch Brewery is not far from my home, yet I only seem to visit once a year. Probably a general aversion to the Tyson's Mall, or any mall really. That's a shame because brewer Justin Damadio brews really good German styled beer. My go to is the Export Export lager, decently hopped and clean. It's a good indicator of the brewery's quality since you can't hide many defects in a light lager. I usually avoid the Marzen and Maibock because these styles are too sweet for my tastes, so move to the banana rich Hefeweizen or the dry Schwarzhier. On this visit, Damadio had brewed a Rye Lager, which is both spicy and hoppy. If you care for even more hops, there's also an IPA and a new Belgium Pale Ale, less IBUs than the Rye Lager, but the hops are more prevalent on the palate. I'll most likely be back on a Tuesday in July since the brewery is hosting special events this month on those days. Check out their events pdf. Across Route 7 from the mall is another brewpub, BJ's Restaurant & Brewhouse. We visited this establishment and learned that the beer is not brewed onsite, it is shipped from their facility in Texas. Thus, they won't be included in the #VABreweryChallenge, but there are a few decent offerings on tap. The seasonal Nit Wit was fresh and spicy as one would expect from a wit and the Harvest Hefeweizen is another summer option. The final Protocol #WineStudio Rosé series features Yannick Rousseau and his "one of a kind" Rosé of Tannat. Yannick was born in the Gascony region of South-West France and was introduced to wine making at an early age from his grandfather's homemade wine. As an adult he worked at various French wineries before relocating to Napa Valley in 1999 where he interned for Newton Vineyard and consulted at VGS Chateau Potelle Winery. In 2007 he set out to create his own brand, focusing on varietals from his native South-West France; first with Colombard and then Tannat. Whereas Y. Rousseau Wines base of operation is in Napa, for this rosé he sourced fruit from Saralee’s Vineyard in Sonoma's Russian River Valley. During the tasting, Rousseau mentioned that producing a rosé using Tannat is very challenging - particularly with such a bold, dark grape. He also said his approach with Tannat is different from those produced in Madiran. He wants his Tannats to be enjoyed early but also to age well. Y. Rousseau, 2014 Rosé of Tannat Russian River Valley, Sonoma County ($24, 13.5%) - 100% Tannat from Saralee’s Vineyard – Matthew's Station; 75% pressed, 25% saignée; fermented in stainless steel; aged for 5 months on the lees with no stirring. The wine starts with a watermelon aroma moving towards strawberries on the elevated palate, finishes dry and acidic.